It was a rejuvenated Chelsea squad. After a poor start to the season, the performance had risen sharply after the sacking of Scolari and the appointment of caretaker manager Guus Hiddink, also the manager of the Russian national team. A run which saw Chelsea lose just a single game in the Premier League during the period, which included a 2-1 win against United at the Bridge after being a goal down. Prior to the semi final against Barcelona, Chelsea had knocked out Juventus and Liverpool, in a fashion that Abramovich has always yearned for. 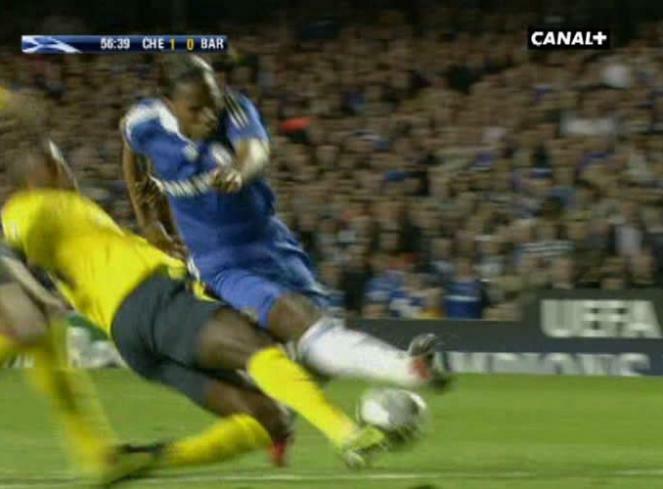 Dani Alves tugs Florent Malouda who falls around edge of box. Referee rules a free kick outside. Toure takes Droba's leg away before he can shoot. No foul given. 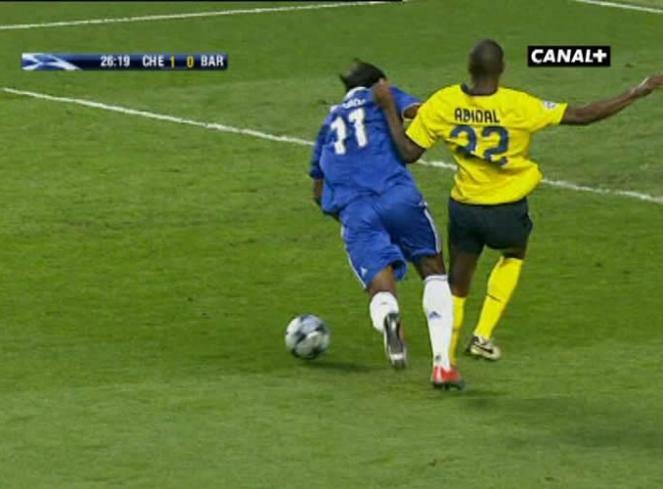 Eric Abidal tugs Didier Drogba’s shirt as the Ivorian goes through on goal. No foul. Should have been a straight red. Ball hits Gerard Pique’s hand in the box. No penalty given. Anelka awed! Another handball in the box. This time, Samuel Eto'o is the culprit. No penalty given. 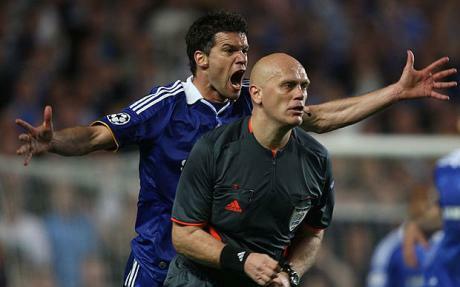 This time, Ballack chases the referee for quite some time. Fines and bans followed but that day was most probably the darkest in the history of the football club. With the form Chelsea was in, you could only say wonder how they could've written history had they reached the finals. A limited, limited showing. Does not relish Premier League competition. Marked out of the game again and contributed little other than another wide shot. Barcelona have always been preferred by the UEFA over such matters. Busquets' Oscar winning performance against Inter, Nesta's shirt pulling in the recent Quarter Finals, van Persie's red last year; these cases just make you wonder why it is always Barcelona who get the benefit of the doubt! Three years on, Chelsea are no longer a force that it was then. Meanwhile, Barca have been growing in confidence, winning two of the possible three Champions Leagues in the period. One can only speculate, how things would've changed had even a single decision had gone towards Chelsea. Maybe in an alternate universe, Chelsea would be holders of the UEFA Champions League by now. The core of each team remains the same with certain changes to the tactics. Mata has taken up the role of Florent Malouda, Ivanovic holding on the Right Back position over Bosingwa, Luiz being the successor of Alex, Sturridge and Raul Meireles on the right, but Drogba still being the preferred Centre Forward over Torres. In the Barca camp, Sergio Busquets has evolved as the best actor, followed by almost everyone in the team, unfortunately even Messi. However, only an idiot would not admit the good qualities of Barca, which have made them arguably the best team of modern time. The waves of attack, with a impenetrable brick wall of a defense, as the CDM comes back to help the centre backs; Barca can beat even the World XI on their day. Except the 5-1 mauling of Tottenham in the last match, Chelsea have been well below par in recent weeks, with the performance against Benfica being one of the worst. Only God can say what would happen if they continue to do the same against the defending champions. The fixtures of Chelsea are not good either, with an important game against Arsenal in between either leg, which can have an effect on whether Chelsea will end up in the top 4 in the league, affecting their changes of Champions League qualification next season. However, Barcelona have an El Classico at Camp Nou in between the legs, which they can not ignore in any case. Real Madrid, leading them by 4 points will surely end up with the La Liga if they win that encounter. It's really gonna be interesting how each team copes with the fatigue. It's the feeling of revenge of the Chelsea squad pitted against the flair of Barca! In a normal situation, I would say- May the best team win, but this is a special case. Who will emerge victorious, only time will tell! It's been quite a long time Chelsea fans have had some bragging rights, and I guess it's high time they get the chance. And can anything be better than beating Barcelona?